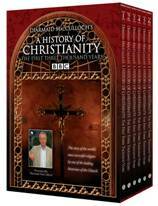 New DVD series examines Christianity’s global roots. There are two billion Christians in the world today, a third of humanity—Protestant, Catholic, Orthodox, Pentecostal, and many more. Though Christians, by definition, are well-versed in the story of Christ and the apostles, many have given little thought to the details of their Christian heritage—the miraculous transferring of their faith from the first Christians huddled at Golgotha, across two centuries worth of cultures and languages, wars, and the rising and falling of empires. How did this small, obscure Jewish sect that preached humility and personal sacrifice become the biggest religion in the world? The answer will surprise you. MacCulloch is one of the most widely traveled Christian historians, and A History of Christianity is the first retelling of the Christian story that is truly global in scope. Filmed in high definition, A History of Christianity takes viewers on a 2,000-year odyssey that reaches the farthest corners of the world, from Palestine in the first century to India in the third, from Damascus to China in the seventh century, and from San Francisco to Korea in the twentieth. The DVD set is available at retailers, including Sam’s Club. The series is also available on Amazon.com and www.ambrosevideo.com.